Untreated obstructive sleep apnea (OSA) has negative effects on medical conditions. You might have heard it already, but untreated OSA can be deadly. By visiting Craniofacial Pain & Dental Sleep Center of Georgia to learn more about sleep apnea, you can take charge of your health. 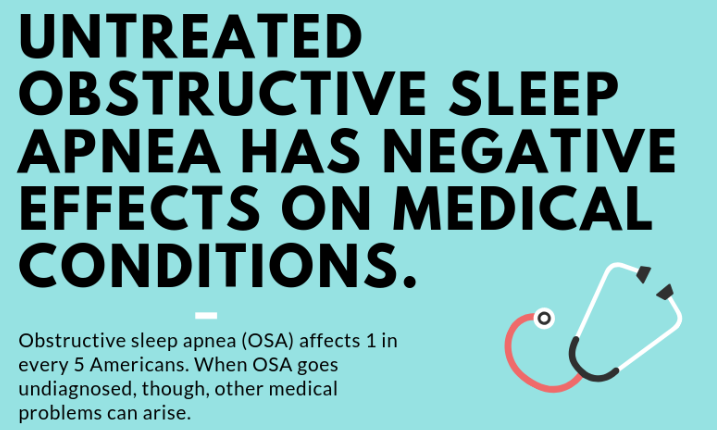 In the infographic below you can learn more about the negative effects of sleep apnea on various medical conditions. The negative effect of sleep apnea on your health should not go ignored or unnoticed. Contact Dr. Patel to learn more about sleep apnea treatment and how you can continue to improve your overall health and well-being. Don’t wait. Act now.